"Growing up, I remember my dad making these for me every time we had leftover rice in the fridge. 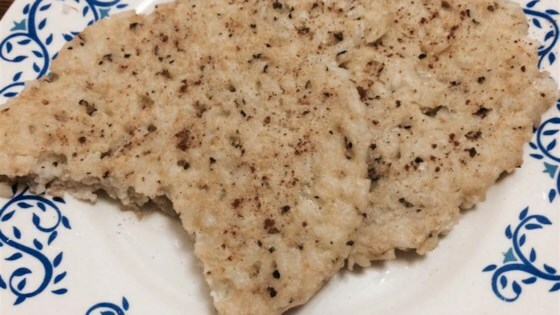 I generally make these for breakfast but occasionally enjoy them for dinner when my husband is out of town and I want to make something quick and easy. This recipe is a great base. Have fun changing it up and making it your own! Great topped with salsa!" Mix rice, egg, basil, milk, salt, and pepper together in a bowl. Melt butter in a skillet over medium heat. Pour rice mixture into the skillet in 2 equal portions. Cook until browned on the bottom, about 3 minutes. Flip and continue cooking until second side is browned, about 2 minutes more. Substitute brown rice for the white rice if preferred. Thanks Lowe! This made for a nice, simple snack. I sprinkled a little cinnamon over mine.